Do you want to get into running, but need a boost? Do you want to turn your running efforts into meaningful community impact? Do you want to run with 13,000 other runners and walkers on the June 6-9 weekend AND benefit a great community cause? Are you looking for a team to inspire you and help achieve your goals? If you answered yes to any of these questions, this team is for you! Halifax Pubic Libraries is an Official Charity Challenge Team in the 2019 Blue Nose Marathonopens a new window. Last year, 73 charities raised $600,000 that went right back to our community. Runners are passionate people, and their fundraising is making a significant impact! Registration is easy. When you register to run any distance in the Blue Nose International Marathon, you’re offered the option to join a Charity Challenge Team. 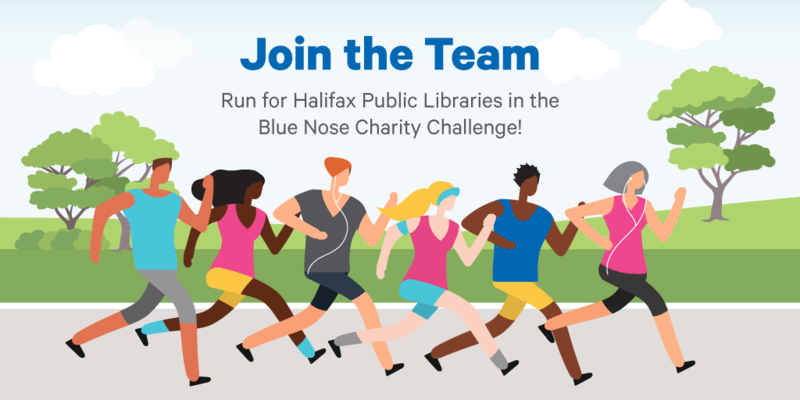 When you join Halifax Public Libraries' Charity Challenge Team, The Page Turning Pavement Pounders, you’ll make your Blue Nose Marathon weekend even more significant because your hard work is also benefiting your local Libraries. You can register for the 2019 Blue Nose Marathon and Charity Challenge at the same time—click hereopens a new window. If you have already registered for a Blue Nose Race event, you can join our fundraising team hereopens a new window by clicking "Join Team." Anyone! Teams are filled with runners/walkers who believe in the cause. The team is not limited to staff or volunteers. Anyone who loves Halifax Public Libraries is welcome to join! Do we all run the same distance? No. Runners and walkers are united by their love of Libraries and desire for community impact. Our team has half marathoners, 10K runners and first time 5K runners. Race distances include: 5k, 10k, 15k, 21.1K/Half Marathon, and 42.2k/Full Marathon, and every distance offers a walking option as well. I'm not a runner! Is this okay? The Blue Nose International Marathon is called ‘the People’s Marathon” because it welcomes all skill levels and every goal is ambitious. There is a distance and pace for everyone. If you were ever thinking of tackling a new goal or trying running, the Charity Challenge at Blue Nose Marathon is a great option for you (and did we mention there are thousands of people cheering for you?). All proceeds raised by our 2019 Charity Challenge team will support Food Literacy Programming in our Libraries. When you’re fuelling your training, you can know that your fundraising efforts will ensure community members will see even more food in Libraries. Check out some of our current food programming to get a sense of the positive impact you'll be making. If this inspires you, why not join the team and train together to achieve these goals? When is the race weekend? The Blue Nose Marathon weekendopens a new window is June 6-9. Find the full schedule hereopens a new window. I already registered for the 2019 Blue Nose Marathon. Is it too late to fundraise? No, it is not too late. You can go to Halifax Public Libraries’ team pageopens a new window and sign up! Welcome aboard, and thank you for dedicating your training to Halifax Public Libraries. I can’t commit to this, but I still want to help! 1. You can make a donation to the Page Turning Pavement Pounders. Donate todayopens a new window. 2. You can recruit runners to the team. Tell your runner friends and family the Library has entered a team in the Charity Challenge and if they love libraries as much as you do, they can join the team! Send this this linkopens a new window and ask them to join the team! 3. Come out on marathon weekend and cheer for runners/walkers who worked hard for their goals and raised money for the Library! 4. There are lots of volunteer opportunities on race weekend. Did you know, the Blue Nose Marathon requires more than 1,500 volunteers to safely get runners across the finish line? Check out volunteer opportunities hereopens a new window.